WOW! I have never seen anything like that. I consider myself a B- when it comes to splicing. Better with 3 strand, lots of back splices and loops but no anchor splices. Plaited line is a little trickier. Done some loops and one anchor splice which worked so, I guess, OK.
Second, there looks to be a hole there. Mis-tuck??? Third, that doesn't look like nylon. Lewmar specifies it. Is it Cotton? I see your inner "Yankee Frugality" is showing but 3 strand nylon is CHEAP! Why not save yourself and buy what you want. No splices, no headaches. A splice to be used in a windlass needs to be flexible. Too big and tight, it won't fit. Too loose and it will snag and fray. One trick is to splice it snug a few tucks then roll it in your palms to loosen/even it out. Tapering plait is easy. You are working with 4 pairs so you just cut, burn and drop one from each pair for a few tucks. I've never had to taper 3 strand, I guess you could halve each strand then cut, burn and drop for a few tucks. It is nylon. just a few years old, some is limp so strands want to flatten out. the "hole" is a pice of black tape. I did these splices with the idea of getting rid of really bad knots that were there. Wasn't thinking about eventual windlass. I need to get a cutter for my soldering gun. That will make it neater. I suppose a horizontal windlass will pass a splice better than a vertical since it only bends 90 degrees? Ozz... That drum is huge! You sure that's not supposed to be at the stern to pull in the fishing net? Aesthetically, I don't think "it's for me", but it's interesting to see different ways of doing things. I do wish Grady would get with the times and start building the anchor locker as a separate compartment from the rest of the cabin so it can self drain directly overboard. I'm actually considering rebuilding the anchor locker so it does just that. Been thinking about it for 3 years now, though... other projects always seem to take priority. Just an opinion but if you're gonna possibly lay out 800' of line at times, the V700 is probably not the windlass you should consider. I've had 2 of them and they are good light to medium duty. Definately need something beefier! Another reason I use a retrieval ball. Oh, and a good set of fids make splicing waaaaayyyy easier!!! Ozz's winch looks like a Mick, which is built down under. Muir make a small one. They are more common than I would have thought, but I guess it makes sense for commercial boats. There is one that is pretty common here, in the larger cruiser category(retirees), that has a wider drum, but I didn't see it pictured. This is exactly what I do for fids. I have a box of various sizwd needles that I pick up in thrift shops for small change. I was looking at a pro fish on ebay but the bids went to high for taking a chance on a used one. I think the rope may start to pull off the top as you pulled it in, given the angle you would be pulling from would be quite a bit higher than it. Maybe not - but it seems like a possibility. If you bent over to do any pulling, it would put a strain on your back and be an awkward pull. 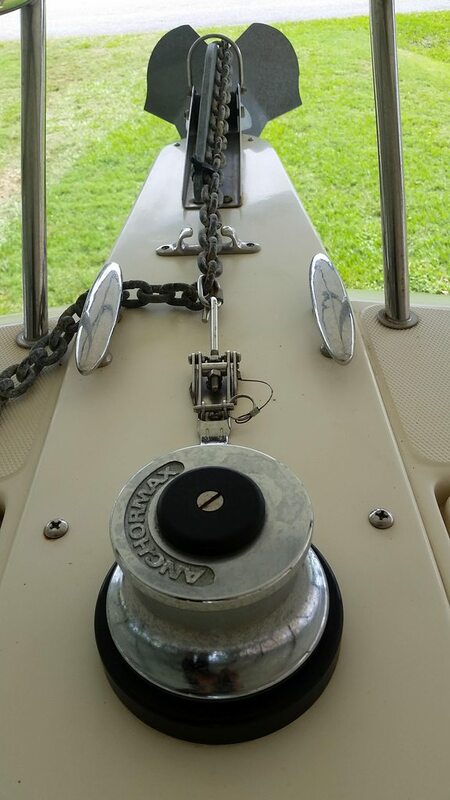 Instead, just use the anchor roller like normal - but maybe step back further, or just sit on the cabin ceiling and brace a foot against the back edge of the anchor locker. That will at least allow for a straight line pull. Either way, you'd need a helper to drop the line into the locker to make this efficient. Here's that Good windlass I mentioned. The problem with the early Goods was that they do not handle chain. Glacier you’re spot on, it is a Micks winch. Sorry, but that is a "short splice", and it doubles the diameter of the line. It will almost surely jam in the windlass, even if tapered. You would need to make a "long splice", and your tucks would have to be very good as well. But in reality, the first 200ft have no splice so any shallow water little day trip will be fine. When I'm out in 150' on a wreck we'll have someone up there who can keep splices clear of the gypsy if necessary. GOOD brand out of NJ is probably the best. I picked one up at the end of last season. Working on getting it on in the time for bottom fishing season. Run the power to a starting battery since you will be running the motors when pulling up anchor. A short splice is no different, and no bulkier, that the thousands of back splices attaching rode to chain, and running through windlasses every day. Taper the short splice and it will work fine. 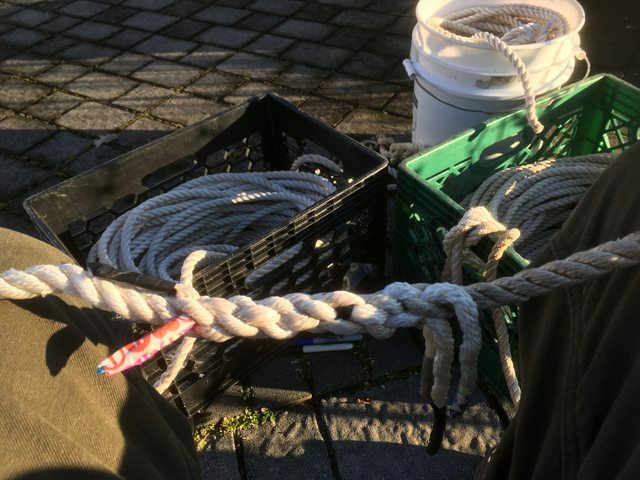 Only use 2 or 3 sets of full tucks in the middle, and the taper that is already caught in the gypsy will pull it through, or over, unless you are trying to break an anchor loose, and putting a lot of strain on the rode, which is not the windlass’ job. That is a piece of equipment.... Cool. 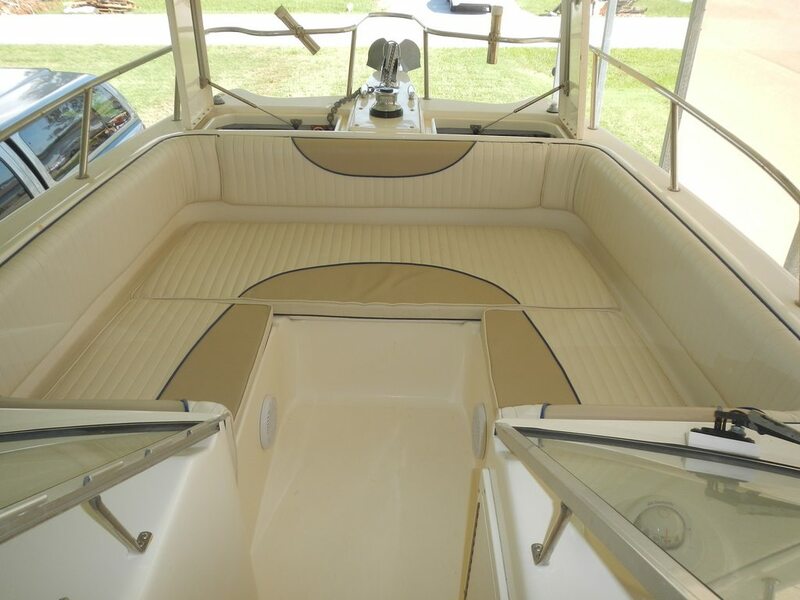 The one I installed was an Anchormax and was this style https://www.wmjmarine.com/c14941.html and it had "spur cut" gears. It was noisy as hell but worked great. I wondered if the ones that have the motor set at 90 degrees to the capstan shaft are any quieter. If you could find one that used helical cut gears, that would be the bees knees.